Many collectors have a soft spot for Lee Middleton Dolls from the Lee Middleton Company; beautiful babies without the ugly wrinkles and creases which many manufactures feel obliged to mar their creations. I began collecting them comparatively recently, with my first acquisition dating only to 2001, but in fact the company has been active for twenty-five years. Lee Middleton changed the way collectors felt about vinyl dolls; before, most designers had insisted on working with porcelain, but Lee’s dolls helped show that vinyl could be just as collectable. Her dolls went from strength to strength. Then, in 1997, tragedy struck – Lee died from a heart attack. Naturally, her employees were devastated. However, out of the heartbreak came an unexpected twist with the discovery of talented Canadian doll artist, Reva Schick, who would not only carry on the Lee Middleton tradition of creating exquisite dolls, but would take the company to new heights. Lee Middleton had believed that her artistic talent was a gift from God, and Reva Schick holds the same belief, continuing the charming custom of including a tiny Bible in each doll box. In 1998, she was nominated for a DOTY award, and since then, has received almost forty prestigious awards and nominations. Yet in spite of all her sculpting, Reva still finds time to go on national doll signing tours and attend conventions, meeting thousands of fans. The dolls appeal to celebrities, too, who are just as tempted by the sweet faces – Oprah Winfrey and Demi Moore are both enthusiasts. The dolls from the Middleton Doll Company are life-size and weighted. Every year new dolls in various skin tones, eye colours, hair colours and sizes are introduced, made from a soft to touch vinyl, which feels very authentic. Their facial f eatures are realistic, and the babies have often been mistaken for real babies, with stories of police chastising women for holding their ‘babies’ on their laps instead of putting them in a restraint, or of leaving them unattended in cars. The quality of the Lee Middleton Dolls is excellent, and this extends to the clothing where only the finest materials are used. Beautiful lace, silky dresses, embroidered flowers, crocheted caps and patent shoes, as well as more trendy cords, anoraks, modern prints and even ethnic traditional dress ensure there is a baby to suit every taste. In 2004, Lee Middleton Original Dolls expanded its line to include ‘Breath of Life Babies’. This collection of incredibly lifelike preemie-sized dolls features a new skin-like vinyl called ‘New Baby Skin’ and rooted ‘Baby Fine’ hair. More than half of the first collection of Breath of Life Babies sold out before even being featured in stores. The various face sculpts also have titles; ‘Sweet Lips’, ‘Munchkin’, ‘Small Wonder’, ‘Lil’ Darlin’’, ‘Little Sunshine’, ‘Cutie Pie’ and ‘Beautiful Baby’ – there are dozens of them, and it’s amazing how, just by varying skin tone, eye colour or hair, the face can appear totally different. Some collectors aim to collect an example of every doll issued which features their favourite face. A few years ago the company set up ‘The Newborn Nursery’ at their store in Belpre, Ohio, and it proved so successful that department stores throughout America now contain these nurseries. Designed to look like a real hospital nursery, the Newborn Nursery lets children go through a fun baby doll adoption process before bringing their new bundles of joy home. When children choose to ‘adopt’ a Middleton Company baby, they can go along to a centre where sales associates wearing nursing uniforms teach the girls how to properly care for their dolls and give the new dolls health ‘check-ups’. They are handed ‘adoption papers’ before the baby is presented to the new little mummy. These nurseries have proved so popular that summer club events are organised where girls and their baby dolls gather to play. Recently, the company opened a museum to show the history and development of the Lee Middleton doll. It’s a must for collectors visiting Ohio, and can be found near the retail store. The tour begins with a replica kitchen table, illustrating how Lee Middleton began her sculpting, and traces her humble beginnings in rural south-eastern Ohio. Dolls on display include rare and interesting doll collections on loan from long-time collectors. Many creations by Reva Schick are exhibited, including one of her earliest works, a fascinating baby created with bread dough and made at her kitchen table! Over the years, various organisations have benefited through Middleton dolls. For instance, when ‘Young at Heart’ was marketed, a portion of the proceeds was donated to Newborns in Need, an organisation providing for premature and newborn infants of needy families. 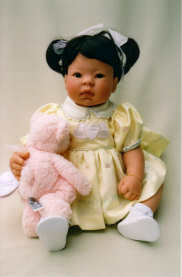 Sufferers of Alzheimer’s disease have been helped too, finding great comfort in cradling the oh-so-lifelike baby dolls. This year’s ‘Blessings of Hope’ range, ’Sweet Morning’ by Reva Schick in various skin tones, supports research, screening and treatment of a breast cancer foun dation, with 10% of the retail price of dolls from the range going to the cause. As I remarked earlier, I acquired my first Middleton doll in 2001. Naturally, I had heard of the company, and had thought the dolls beautiful, but it was when I saw a picture of ‘Young At Heart’ that I was truly captivated. There was something about that mischievous grin and little button nose, as well as the fairytale pink and white dress, which really melted my heart. And that same year saw the release of ‘American Beauty’, another gorgeous doll – that was when I knew I was hooked! Sound advice – but I believe totally unnecessary. 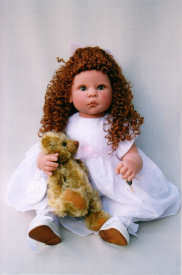 The dolls are so beautiful, so realistic, that surely no-one could ever mistreat a Middleton Doll Company creation!